This is family bike camping! 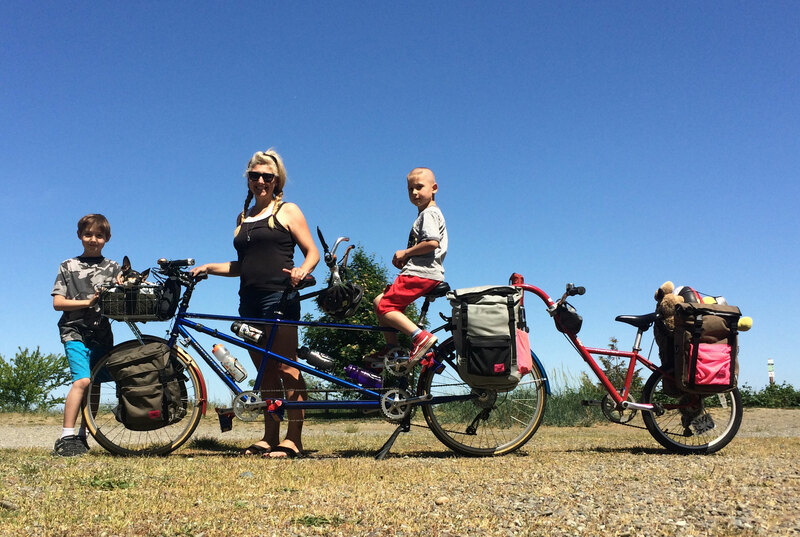 Bike camping with kids is just like car camping with kids, but so much more fun! I’m no pro, but we’ve done a bit of bike camping. Primarily overnighters to the closest campground, but with repetition comes refinement. Can I fit all the gear on the bike(s)? Where can I ride on this heavy bike? but I’ve gradually replaced things (stove, tent, pillows, my sleeping bag) with lightweight versions. Three full-size pillows looks neat and all, but now I can fit our stuff into six the panniers of our tandem plus trailer bike or the big Xtraycle FreeLoader bags of the Surly Big Dummy longtail cargo bike with room to spare. …I had read that kids’ squishy bodies don’t need sleeping pads so the Lite-Cores were for we adults, but when the kids discovered they were their favorite colors, they commandeered them and we parents were left on the cold, hard ground. So always pack sleeping pads for everyone! And now I have a much comfier one anyway. One+ change of clothing for kids (shorts and sweatpants just to be safe…more than necessary), one change of clothing for me, pajamas for me. Sweatshirts for each of us (with one spare sweatshirt for big kid, oops), knit cap for me since my sweatshirt didn’t have a hood. Toothbrushes, kid toothpaste, adult toothpaste, sunscreen, contact lens container and solution, Advil. Snow Peak BiPod Stove, 1 large Snow Peak fuel canister, lighter, 1 pot, 1 kettle, 3 bowls, 3 spoons, 1 fork, 1 knife, 1 mug, 3 napkins, 1 dish towel, sponge (1 quarter of a sponge I cut up), small container of dish washing detergent, 1 ice pack, Aeropress and coffee filters. Package of 7 hot dogs, 5 buns, small container of ketchup, carrots, 2 avocados. 8 instant oatmeal packets, ground coffee. 2 apples, 2 bags Earth Balance Puffs, 4 blueberry muffins, 2 croissants, 1/2 bag potato chips, 6 granola bars. Taking a Friday evening ferry meant long lines for the cafe so it was important I have blueberry muffins on hand ahead of time because the kids think ferry = blueberry muffins. In general, saving cargo space and buying food on the ferry or in town is a great idea, though! 4 big ones, though I had planned on 2 little ones. Still working on this area of overpacking. The sea monster was technically my stuffy–my Mother’s Day present created in sewing class that day. Dog bed and baby blankie Pixie rides in in the front basket, small container of food, small empty container to put water in, packet of salmon snacks, homemade dog sweater. ECOXGEAR EXOXBT. 1.5 pounds…or 680 grams if that’s your unit of choice. Kinda heavy, I guess. RAVPower® 3rd Gen Deluxe 15000mAh External Battery Portable Dual USB Charger 4.5A Output Power Bank (holds 7 iPhone charges, has a flashlight! ), iPhone USB cord and plug adapter, Garmin Edge 25 cord. Abus folding lock that I use to lock front wheel to frame overnight and would probably also work well as a tent stake mallet, but I haven’t hammered with it yet. Extra water is always good. We didn’t run low, but always fill every cage with a full water bottle, and sometimes shove extras in panniers. I have a big car camping lantern, but I’d like a small one. For this trip I perched my iPhone flashlight atop a lidless water bottle and it lit our dark dinner table. SWIM SUITS! ALWAYS BRING SWIM SUITS! MAY IS NOT TOO EARLY FOR SWIM SUITS! Quarters for the shower. We haven’t used campground showers before, but the kids got so sandy this time. S’mores fixings. Despite our late arrival and the kids begging to go to sleep at 9:15 as soon as they were done eating, the next day they were pretty pissed there had been no s’mores. From now on: always s’mores or at least up-front discussion about lack of s’mores. I don’t feel that I really overpacked, but I had way more snacks than necessary (but you never know!) and I think I’d like to try bringing a frozen can of beer instead of the ice pack…that makes sense, right? 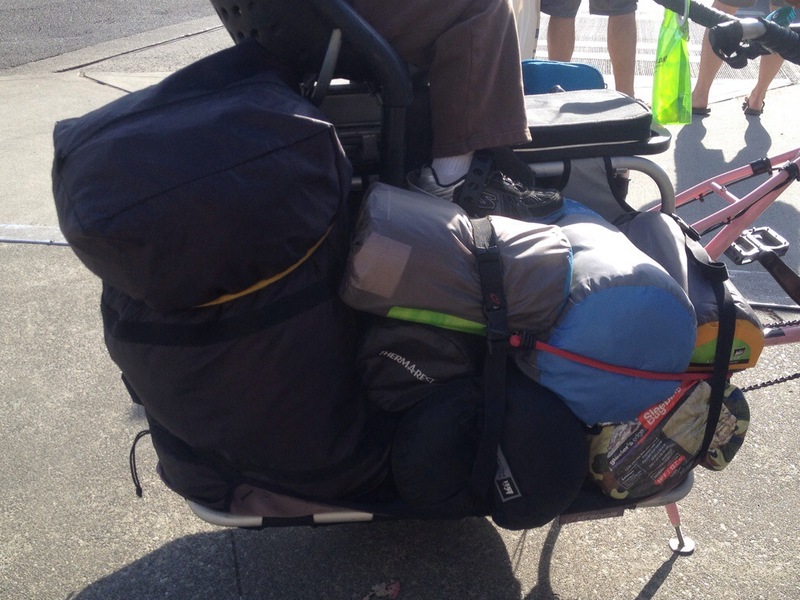 Here in the Seattle are, I don’t feel there are a lot of camping options when on a very slow bike with kids. My bike is too heavy to push up a hill, even with the kids walking alongside and I don’t want to be on certain fast roads that might not bother quicker bicyclists. 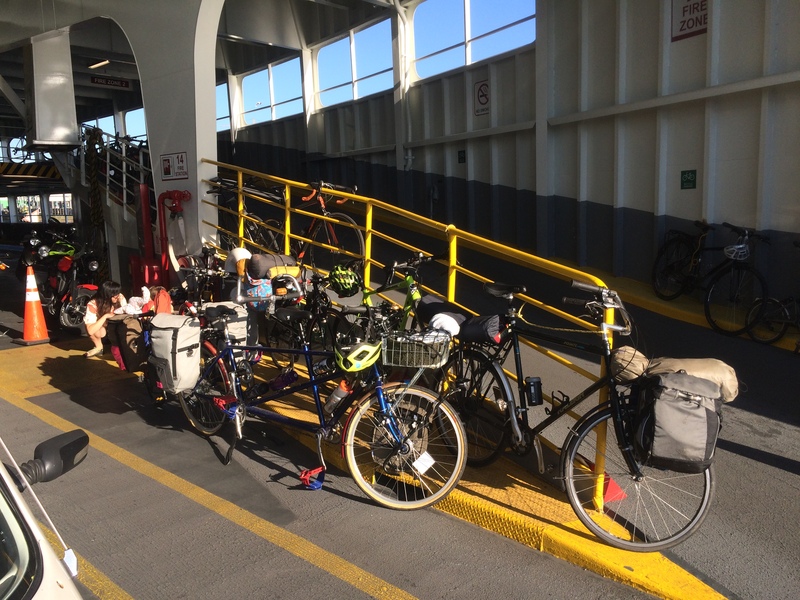 My cargo bike and tandem don’t fit/aren’t allowed on our buses and trains (Amtrak, light rail, street car…well maybe street car, but it doesn’t get us very far) so that leaves us with the ferry as our only option besides plain old biking to the destination. 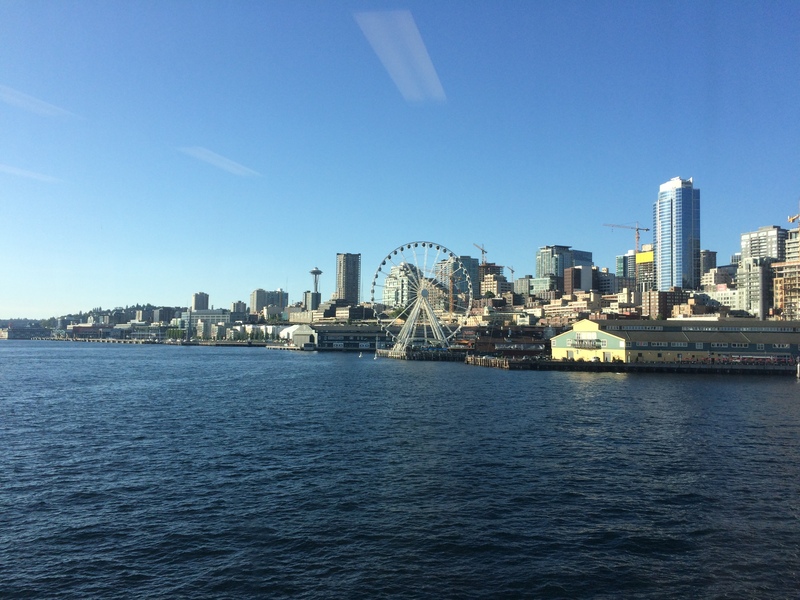 This last trip (and most of our other trips) was to Fay Bainbridge Park via Washington State Ferries from the Seattle waterfront, 6 miles from home, and then 7 miles from Bainbridge Ferry Terminal to the park. I camped at Manchester State Park with 13 adults, using my Surly Straggler (and my load was super light because I forgot my tent, doh!) last summer and I think it would work OK with a slow, heavy family bike. 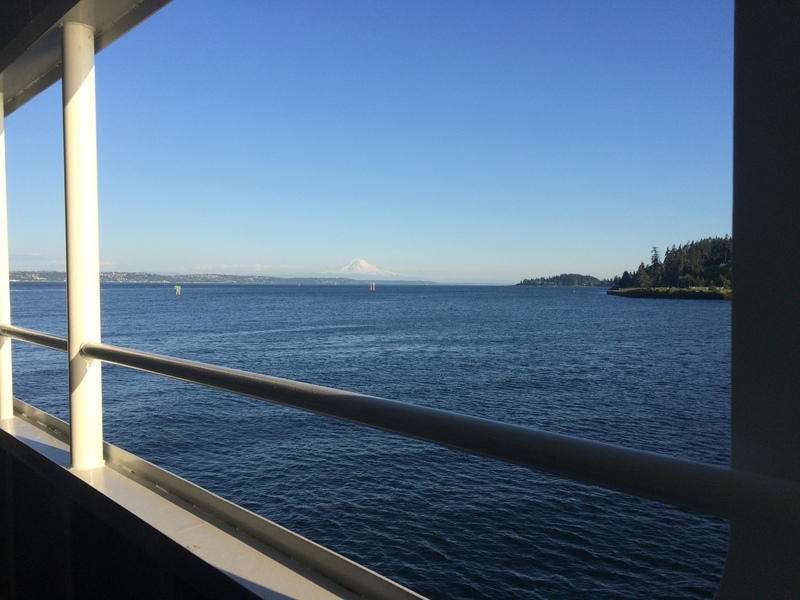 Coming from our home in Wallingford, the Fauntleroy-Southworth ferry is a pretty long haul with 17 miles to the Fauntleroy Ferry Terminal, but it’s mostly flat until one big climb out of Lincoln Park at the very end. We’ll try this soon. Actually, I thought we’d try this this weekend, but just moments ago decided we’re going brave the hills at Illahee to try to coordinate with a friend. Last Spring Break we took the Victoria Clipper from the Seattle Waterfront to camp at Goldstream Provincial Park. There are closer campgrounds to Victoria, too. And wonderful trails to use to reach them. We haven’t done this yet, but this summer we plan to take the Clipper to the San Juan Islands and hopefully do some island hopping! I think Illahee State Park might be a bit hillier than I’d like to camp with a family bike, but I camped at Illahee on my Surly Straggler with Pixie recently. Now, for those of you not constrained by very heavy and slow bikes, my wonderful friend Marley (with whom I camped at Manchester) recently wrote A Non-Definitive Guide to Bike Overnighters within an Hour-ish of Seattle. Our trip this past Friday was a fun, last-minute trip. I usually plan things way in advance so this was out of character and so adventurous! I stayed up much too late Thursday night (NOT biking on the closed viaduct, of course! I would never! ;)) and got up earlier than necessary for En Plein Air Coffee Club and then rushed way uphill to help a friend with a thing and afterwards, while heading towards Capitol Hill to route test for Seattle CycloFemme two days away, I decided it’d be a great day to go camping! 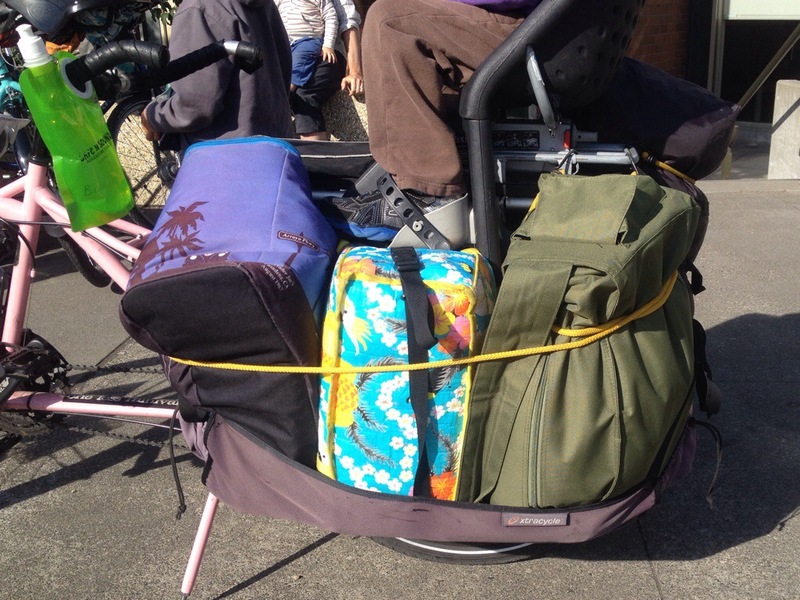 So I quickly route tested, rushed home to swap bikes (road bike for Surly Straggler and two panniers) to grab some groceries, and then packed up the tandem plus trailer bike with all our gear. Somewhere in the packing-up I remembered my first grader had after-school sewing class so we weren’t actually free to skip town at 3:40. Doh! That’s where not sleeping enough will get ya. But had I realized ahead of time our weekend didn’t start until 5:20, I never would have considered camping. So we patiently waited, I grabbed the remaining kid (five minutes early) and we raced to the ferry. Miraculously we made the 6:20 p.m. ferry! This after dropping the chain twice, dropping a pannier on Alaskan Way once (eek!) and crawling up Dexter at 3mph. 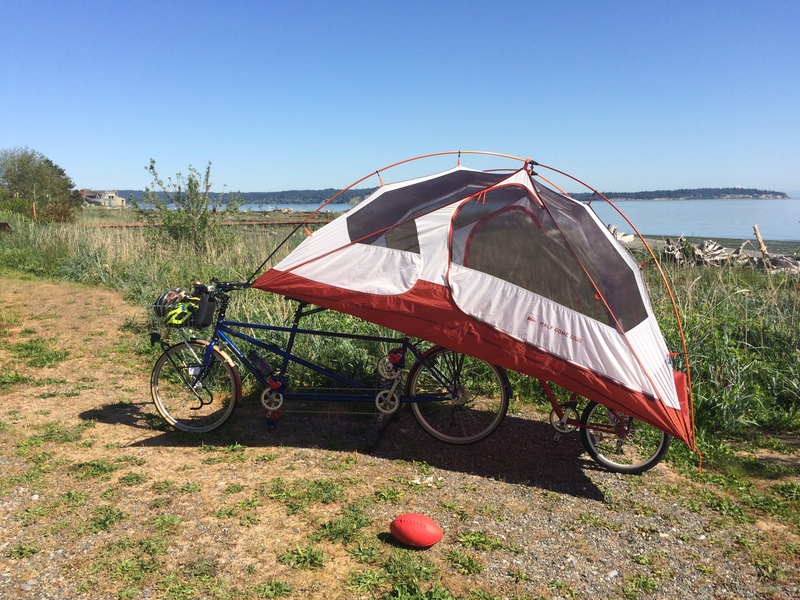 All the photos from there trip are here: Bike camping at Fay Bainbridge – May 6/7, 2016. Check captions for details. In the past I have been able to use my Orca card in the bike lane at the ferry terminal and ask the adjacent kiosk to charge me separately for the kids (kids under six are free, FYI). But this time the ticket agent at that closest kiosk said I couldn’t use Orca for a non-standard bike and I would have to use one of the other kiosks. I was charged $14.30 for an adult plus bike and a kid plus bike. I feel that a weekend trip may have cost less, but of course this is always at the discretion of the ticket agent. The 35-minute ferry ride was great. Lovely views. And long lines at the restaurant as predicted so our snacks-on-hand came in handy. And I discovered three friends were also bike camping at Fay. I like to ride halfway up the hill from the ferry and then pull over at the Bike Barn and wait while the cars offload rather than share the road with them. I timed it this time. It’s a 10 minute wait, but of course it feels much longer. We only waited 9 of those 10 minutes because I got impatient, but then had to ride up the sidewalk because five buses took up the shoulder-less right lane. In the future it would be helpful to have a 10-minute activity of some sort planned for this stage (more for my sake than that of the kids!). Nowadays we take the flat highway route to Fay. It is a highway with highway speed limits, but most of the shoulders are very wide and drivers on Bainbridge are very used to seeing people biking all over the place. Here’s the hilly, scenic route used on Cascade Bicycle Club – Chilly Hilly and Squeaky Wheels – Bike for Pie. And probably the upcoming Alleycat Acres – Streets + Beets. Even with the flat route, there’s still one proper hill on Lafayette Avenue, but halfway up it flattens out at a cemetery. We took a breather there. To provide a more realistic picture of family biking on Bainbridge, it took us one hour and 17 minutes to get there with a stop at the fire house and one hour and 13 minutes to get back with a quick stop at Frog Rock. 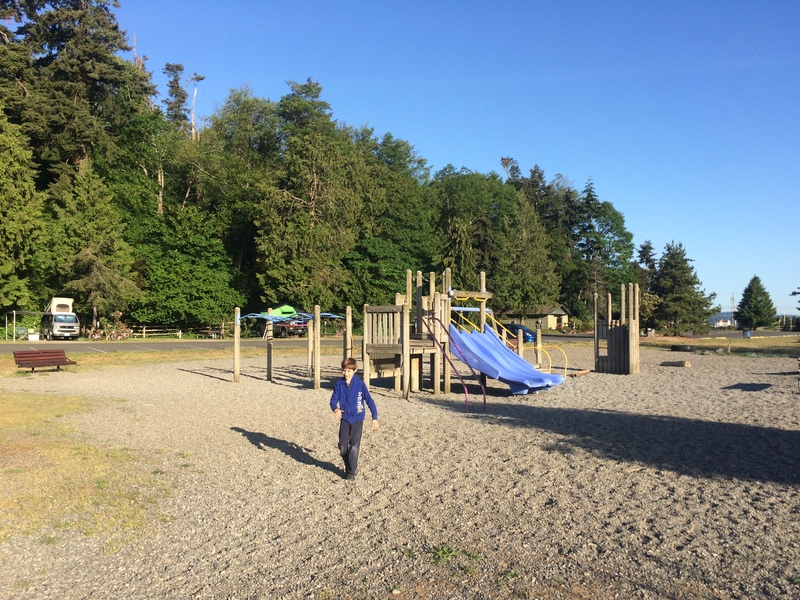 There’s a playground at Fay, but the beach is so amazing that the kids all tend to stick there. 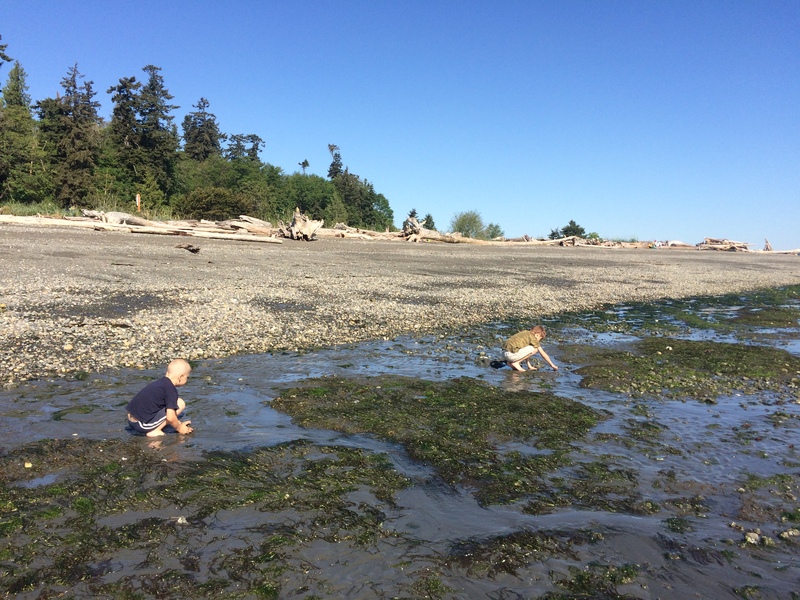 At high tide they climb on the big log and throw rocks into the sound and at low tide there are sea anemones to admire, geoducks squirting left and right, and wet sand to throw at your brother. I never know what to pay. Hiker/biker is $7, but in the past we haven’t had to pay for kids. The camp hosts weren’t in when we arrived and I was feeling spendy so I decided to pay $20 for site #37, figuring three hiker/bikers would be $21 anyway. No one was at the kayak area so I could have just set up there and saved $13. One new discovery this trip: if one kid sleeps with his head on the opposite side as the other, it makes the small tent feel more spacious! I hope I can convince my nine-year old to do this always because we’ll never outgrow the two+ person tent in that case. However, I do have a second, smaller two-person tent to add alongside when the day comes they get to big for us to all cram into one tent. June 4-5, 2016 – I’ll lead a group back to Fay Bainbridge for Bike Overnight June 4-5, 2016. Our awesome camp hosts from this trip will be away running a race just this one day, but Ranger Mike, the Owl Show guy (apparently he’s not a ranger, but our hosts said he’ll love knowing we call him “Ranger Mike”) will be in charge. They thought our staying in the kayak area should probably be fine and they usually charge the $7 hiker/biker fee per tent so that’s nice–free kids! June 25-26, 2016 – I hope to recruit someone to lead a Swift Campout to Fay because I’m unavailable. Last year’s family biking Swift Campout was awesome! July 30-31 – Our annual family biking camping trip to Fay. I should really create the Facebook event for this soon! As always, please feel free to provide your tips below in the comments! You are so AWESOME!!! Great information for newbies and tips for those with experience. 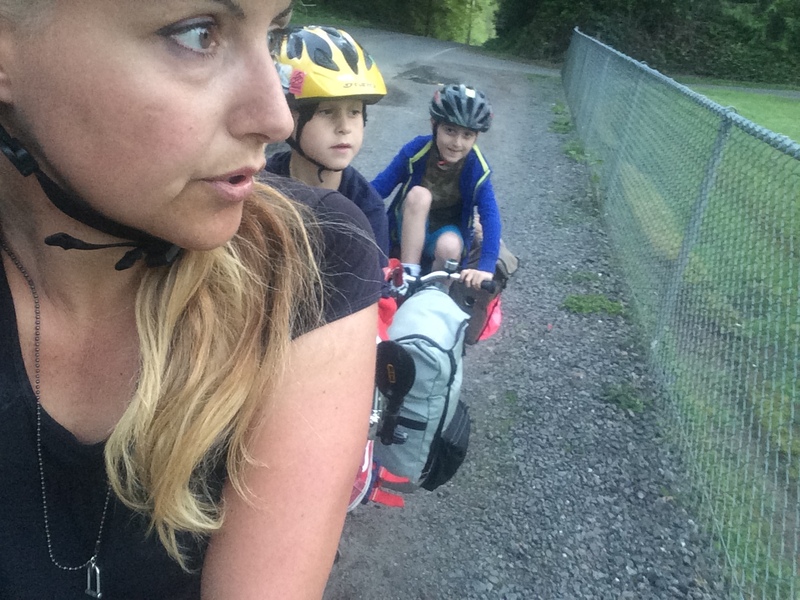 We enjoy bike camping with our kiddos and hope to check out some of your recommendations! You are such an inspiration; woman, mother, biker! Thank you. This sounds like a great overnight! 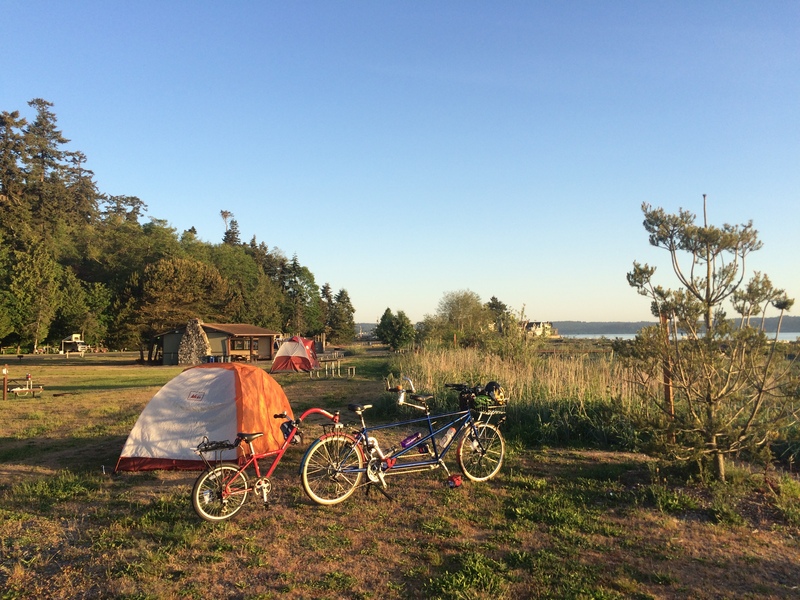 I’m looking forward to doing a bike camping trip with my son in a couple weeks at Spencer Spit State Park on Lopez Island (car to Anacortes + bike onto the ferry), and then also hoping to join the June 4th weekend! Question — does the Clipper allow cargo bikes? If so, that sounds like a fantastic way to get up to the islands if so. The Clipper does indeed allow cargo bikes! But it’s expensive: regular bikes are $20 each way and cargo bikes or tandems are $40. That convenience is worth the price for me, we’re excited to get up to the San Juans so easily this summer. https://coldbike.wordpress.com/2013/04/08/elbow-loop-bikepacking-dad-and-two-kids/ That is awesome! My bike and kids do want me to take them camping, soon and frequently. Now *that* looks awesome! We have yet to do any camping that includes gravel. Some day!! Thanks Madi. Now, what would you do/pack differently for two nights? I’m wondering about food. I never bring a cooler (though it would expand eating options, but space and weight) and I like to have camp fire things on hand (hand axe, back up lighter fluid). We lay our heads on rolled up extra clothes in lieu of pillows. This year we have to add a second tent : ( but gained a newly independent rider (more cargo space!) oh, and added a dog. :-/ Going to be an interesting experiment. It’s been about 4yrs since we bike camped. Must think /minimalism/. I know you’ll do fine! Sigh, I don’t know what to do for two nights. Last summer we did hot dogs the first night and plain pasta (picky kids make it easier, I guess!) the second. I can’t wait to “see” your trip!! !